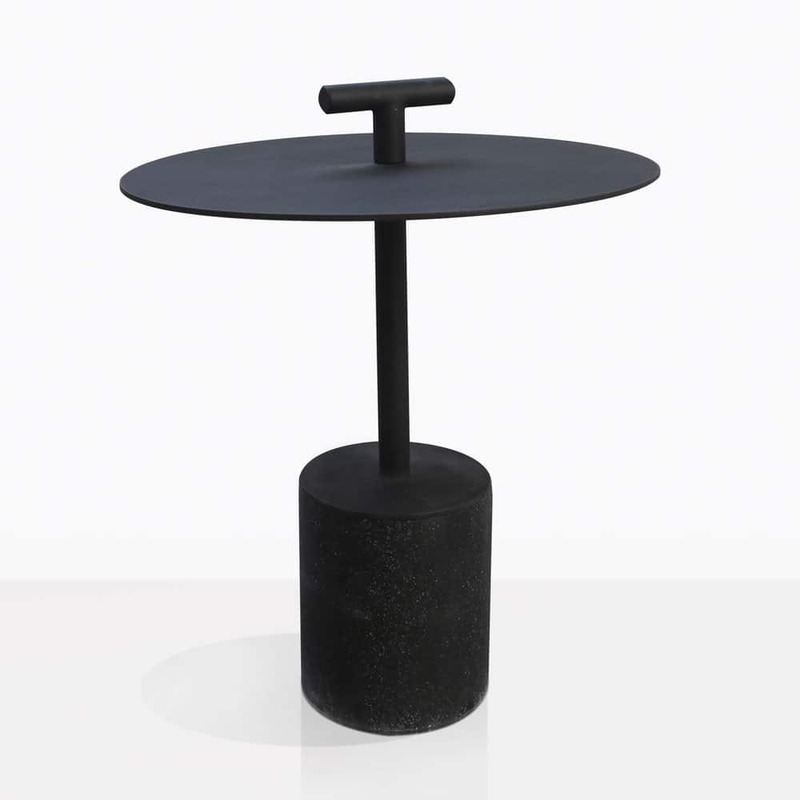 Be allured by the illustrious, contemporary, and striking design of the Flight Outdoor Side Table with a matte black finish. An incredibly modern, unique look, the Flight Side Table has detailing that echoes the art deco period while giving off a solid 21st century look that is daring, splendid and one of a kind! The base is made with concrete and will be sure to hold this table in place. The handle on the tabletop is functional yet it adds a brilliant and eye-catching design that you won’t see anywhere else. Visit our showroom to see this spectacular side table in person. Our Flight Outdoor Table is made from concrete, fibreglass and metal, chic and robust materials which looks incredible. But the key to this piece is in the design. The Flight Side offers a lovely, flat surface, rounded for perfect communal feeling, with a railway style handle that leads to a slender pole fixed to a cylindrical base. It’s bold, beautiful and perfect for adorning your space with killer style! Place two of your Flight Side Tables in your courtyard on either side of a simple teak chaise for a polished and effective setting. Tie the look together with black cushions, or a Sunbrella® umbrella to really crisp up your space. Perhaps you have sun loungers that are awaiting the perfect spot to read that book, drink or snack? A Flight Outdoor Side Table will offer the perfect solution to your relaxing needs! As with our many materials that grace our fashionable outdoor furniture, the Flight Side Table is built to last. Powder coated metal, concrete and fibreglass means a longer lasting product that looks and feels great, while being suitable for outdoor use with minimal maintenance! Design Warehouse is revered for our stylish and luxurious range of quality furniture. From the tremendous side tables, to larger bar, cafe and dining varieties, to seating – deep, dining and relaxing and much, much more! We are confident our vast array of outdoor items will give you the options to create the open air living area you have been dreaming of! The Flight Outdoor Side Table is available now! Call us today to get this unique and fabulous piece in your space!